Accessing and applying for Australian government funded courses used to be difficult if not impossible. Complex, custom solution to run every aspects of the Develop My Skills business from website, call centre and integration with course providers. If you even knew that there were thousands of government funded courses out there, finding them, understanding them and enrolling them is nigh impossible. Develop My Skills completely changes that. 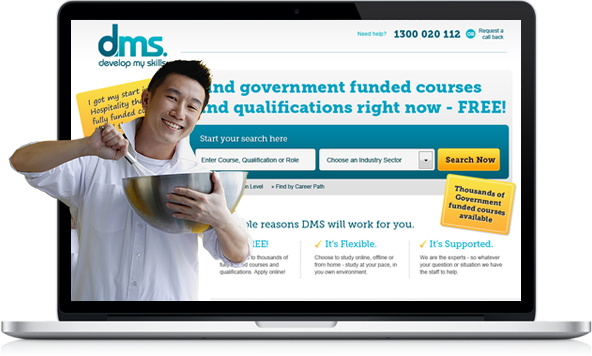 Develop My Skills is a plain-English website and search engine for finding, comparing and applying for eligible training and courses at different Australian training organisations and TAFEs. The underlying website and platform developed by Wiliam underpins every aspect of the Develop My Skills business including CRM, reporting and a white label solution for partners. To say that it has revolutionised the tertiary Australian vocational training would be pretty accurate.